Hello everyone, Winnie Griggs here. November has always been a time to celebrate family to me. My parents got married in November. My husband and I got married in November. Two f my four children were born in November. And quite a number of members of my extended family also have anniversaries and birthdays this month. And of course the month is always capped off with Thanksgiving, a holiday that is always celebrated, at least among my clan, with a large gathering of family and friends. 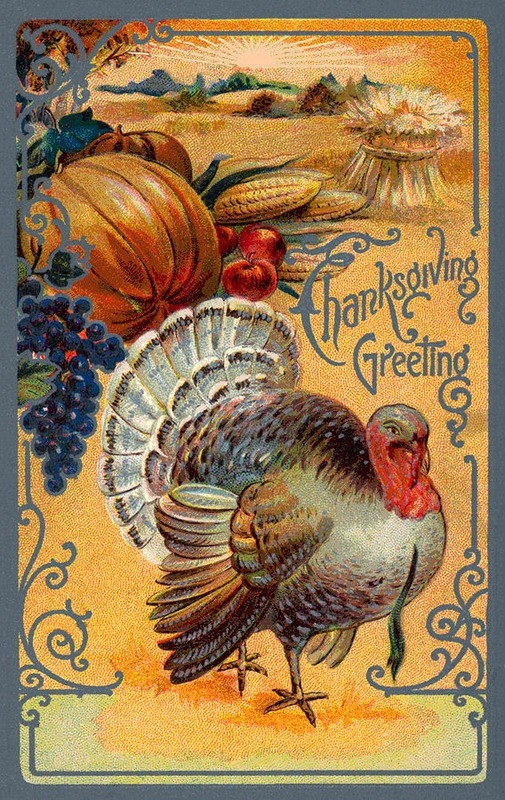 And since we're just a few short days away from Thanksgiving, I thought it might be fun to list some of the history and trivia surrounding the holiday. 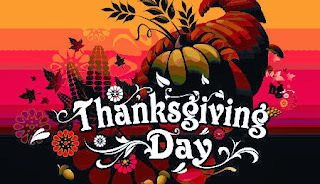 The first Thanksgiving celebration took place in 1621 and lasted three days. It was a true festival that included games as well as food. The menu is thought to have included lobster, rabbit, chicken, fish, squash, beans, chestnuts, hickory nuts, onions, leeks, dried fruits, maple syrup and honey, radishes, cabbage, carrots, eggs, and goat cheese. In 1863 Abraham Lincoln issued a Thanksgiving Proclamation that officially set aside the last Thursday in November as the national day of Thanksgiving. Sarah Josepha Hale, the editor of The Godey’s Lady’s Book magazine and the author of the nursery rhyme Mary Had A Little Lamb, was instrumental in persuading Lincoln to do this. In 1920, Gimbel’s of Philadelphia held the first department store sponsored Thanksgiving Day parade. Four years later Macys launched its own version and that one soon overshadowed Gimbel’s and became a Thanksgiving tradition. 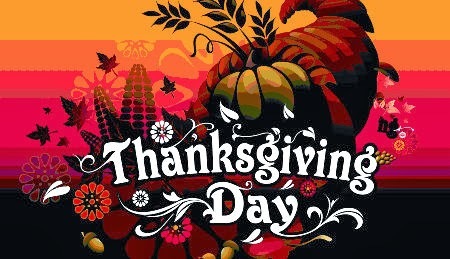 In 1941 Congress passed a law declaring that Thanksgiving would be celebrated on the fourth Thursday of November rather than the last. Beginning in 1947 the National Turkey Federation has presented a live turkey to the U.S. President. The president then ‘pardons the bird and it normally lives out its remaining days on a public farm in Herndon VA called Frying Pan Park. Approximately 280 million turkeys are sold for the Thanksgiving holiday in the US every year. To determine if a cranberry is ripe enough to harvest and sell commercially, it must be able to bounce 4 inches. And now I'd love to hear about any Thanksgiving traditions you and your family celebrate, or any bits of holiday trivia not mentioned here. And to all of you, I wish for you on this upcoming Thanksgiving a wonderful day filled with remembrances of all the many blessings we have in our lives, both past and present. Happy Thanksgiving, Winnie! Our family gathers together with all of our favorite dishes set before us. Our dining table is full and we are very thankful. Hi Melanie - that sounds like my favorite kind of family tradition. I wish you and yours a most blessed and festive gathering. We gather together with our family for a meal and it is a wonderful time of food, fun, and fellowship. We are blessed to enjoy four generations. May you and your family enjoy a joyous and blessed Thanksgiving! Sometimes, the small Thanksgiving are what we need. It allows for more reflection on our blessings and brings those who are gathered that much closer. Hoping you have a lovely day with those around you. Hi Winnie, Thank you for all the information about Thanksgiving. I never knew how it came to be the fourth Thursday of the month...now I know. Since most of our family lives far away, my 85 year old mom, my husband and I have been invited for the last six years our friend's house for Thanksgiving. They have eight children that are quickly growing (the youngest is now 15) and with all their extended family and friends there are usually about 28 to 35 of us gathered together to enjoy wonderful food and then we have a worship service in their great room later in the day. Giving thanks back to God is always a wonderful way to celebrate. Their home is huge and they've turned it into a Bed & Breakfast. We always have such a wonderful time. Hello Winnie. Bet they are missing you over at P & P. :) I enjoyed this. But I didn't know they had some of these veggies yet at the first Thanksgiving when the Indians taught the Pilgrims how to grow corn the year before. This sounded like a lot of food. I don't have a trivia for you, but did have a wonderful Thanksgiving Day. My 4 children and their grandkids. So with three of my four children there was 3 families of four generations. The other daughter only has one child and no grandchildren yet. We always have a wonderful, loud day of fun. And, with each family bringing food, the food is bountiful at our gatherings. My favorite tying is to have a family get together, but doesn't happen too often. I had 3 greats in a period of 5 months. So i especially enjoyed watching all of the generations enjoying each other. Hope you had a wonderful day. Our family is big and we usually have turkey AND ham! For about thirty years, we've had angel eggs (same as 'devil'ed, but prefer angels to devils :) We always invite any holiday 'orphans' folks we know without family close. And since we live in NE TX, deer hunting early Thanksgiving Day and the day after is traditional as well! My husband and I are rearing 4 grandsons these past eleven years. The boys have Thanksgiving dinner with us then all go to their other grandmothers, so O'Pa and I have a traditional movie date/dates : ) during this time alone.